New! 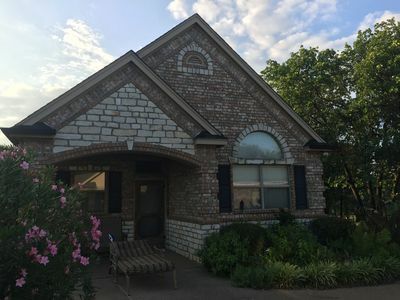 3BR Fort Worth House near AT&T Stadium w/ Spa! 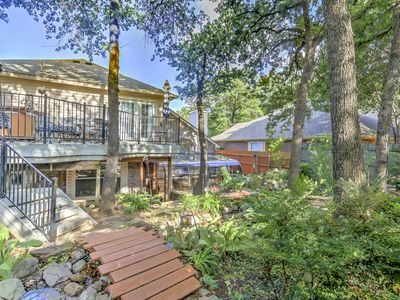 Explore the City of Cowboys and Culture from this 3-bedroom, 2.5-bathroom Fort Worth vacation rental house. With 1,600 square feet of well-appointed living space, this charming home offers sleeping accommodations for 8, a beautiful backyard garden, a spa and four season sun/moon dining room. 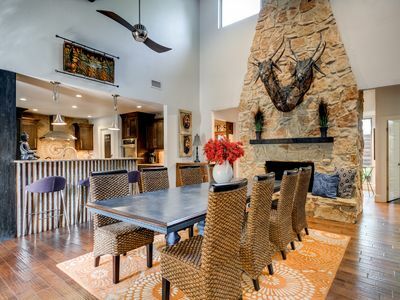 Whether you spend your stay in the sunny backyard oasis or venture out downtown, this Texas property guarantees you and your group the vacation of a lifetime! 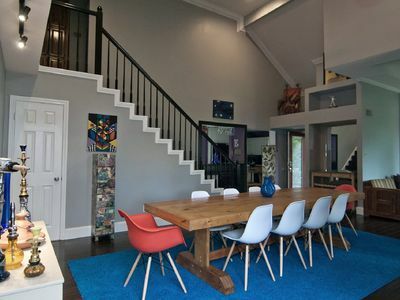 Enter this home through the living room, decorated in contemporary style furnishings and colorful decor. Sink into the leather sofa and decompress while watching your favorite show on the flat-screen cable TV. Walk through the curtains on the far side of the room and enter into the four season sun/moon room. Rain or shine, day or night, you can enjoy dining in this refreshing space, which includes a table set for 6 and floral accents. Head back inside to the fully equipped kitchen, where you can prepare your favorite flavors from home during your vacation away. The space includes all your essential cooking appliances, plenty of cabinet storage and a center island. Be sure to make use of the complimentary brew station, which features a varied selection of international teas and coffees. Walk upstairs when you’re ready to call it a day and retreat to the bedrooms. The master bedroom includes a queen-sized bed, beautiful tray ceilings, flat-screen cable TV and a private en suite bathroom. The other 2 bedrooms include their own perks as well. The second bedroom also features a flat-screen cable TV, while guests staying in the third bedroom can look forward to balcony access. The second-story balcony features an 8-person spa and patio furniture. Walk down the stairs to the backyard area and discover your own private Southern paradise. This outdoor space is beautifully landscaped with lush foliage and features a waterfall that pours into an exotic koi pond. The space is also equipped with a unique grill area and a fire pit. 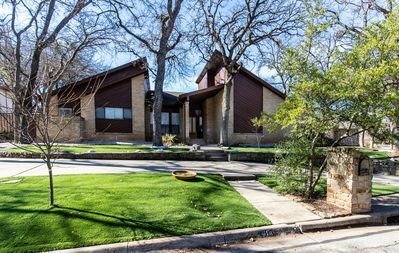 Nestled in a quiet residential neighborhood not far from town, this property provides both privacy and convenience. Located only 10 minutes from downtown Fort Worth, you can partake in a unique shopping experience at Sundance Square, dine at a traditional Texas barbecue joint and stop in for a live show at one of the various concert venues. 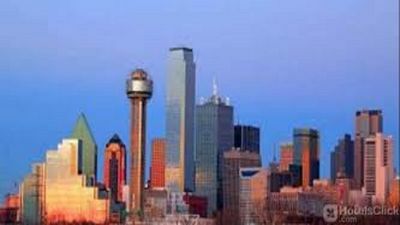 Downtown Dallas and the charming city of Grapevine are also only a short distance away. Make a day trip out to Grapevine for wine tours and antique shopping. Visit Dallas West End Historic District for more fun-filled activities and adventures through time. Tour the John F. Kennedy Memorial, watch the manatees swim at The Dallas World Aquarium and learn about the area’s rich culture and history at The Old Red Museum. Other nearby attractions include Six Flags Over Texas and At&T Stadium, both only a 12 minute drive away. As well as Globe Life Park in Arlington and Stockyards Championship Rodeo. 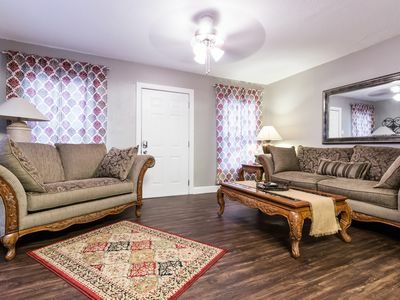 - Amenities include a fully equipped kitchen, in-unit laundry machines, air conditioning, wireless internet access, 4 flat-screen cable TVs, four season sun/moon room, second-story balcony, spacious backyard area, spa, koi pond, gas grill and more! College Bowl Game Home w/Backyard Entertainment & 2 miles from AT&T Stadium!